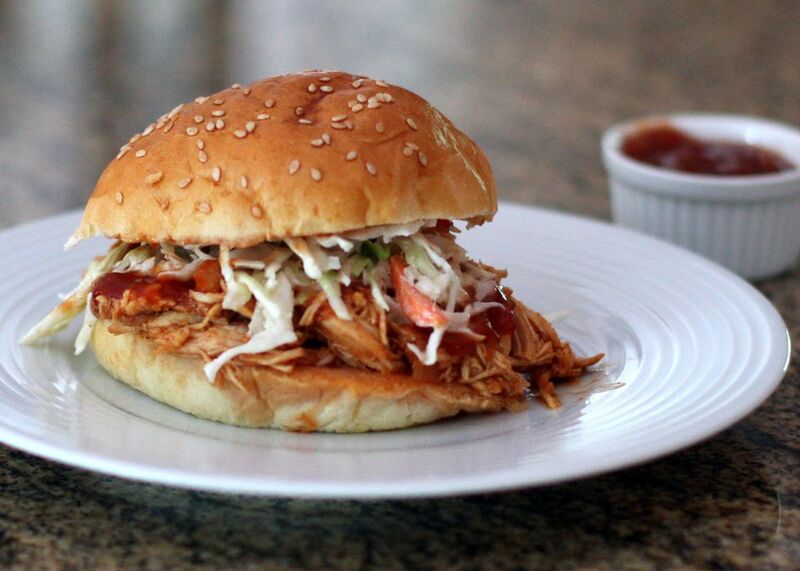 This delicious crock pot chicken barbecue is made with cooked and shredded chicken breasts. Feel free to use all or part chicken thighs in the dish. If you use chicken thighs instead of chicken breasts, they may be cooked for a longer period of time. Feel free to use 1 1/2 cups of barbecue sauce along with the hot pepper flakes and garlic powder and skip the rest of the sauce ingredients. Serve these sandwiches for lunch or dinner with coleslaw and dill pickle slices, or make party-sized sliders. Combine all ingredients for the sauce in the slow cooker. Add the chicken; turn to coat thoroughly with the sauce. Cook the chicken on high for 2 to 4 hours, or until chicken is fully cooked. Shred or chop the chicken and return it to the sauce in the pot. Mix thoroughly so all of the chicken is coated. You can keep the slow cooker on low or warm to keep the chicken warm for serving on soft or hard rolls. While chicken breasts are a lean choice, chicken thighs are moister and hold up better in the slow cooker. Use half or all boneless chicken thighs in the recipe extra-tender barbecue. Avoid overcooking the chicken breasts. Check the temperature after the 2 hours is up; 165 F is the minimum safe temperature for chicken. Freeze leftover barbecue in airtight containers or bags for up to 3 months. Replace the ketchup, brown sugar, Worcestershire sauce, soy sauce, and vinegar with 1 1/2 to 2 cups your favorite barbecue sauce. For a smoky flavor, add about 1 teaspoon of liquid smoke to the sauce mixture. Or add a smoked flavor seasoning, to taste.